The Jacksonville Jaguars have already clinched a playoff berth and are just one win away from a division title and a home playoff game. However, the Jags are still struggling to get their corps of wide receivers healthy. It’s possible that Allen Hurns will be able to return for the Week 16 games against the 49ers. But he’s still listed as questionable after missing more than a month. 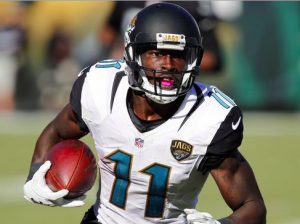 Meanwhile, the team has ruled out Marqise Lee for Sunday’s game in San Francisco. Lee was hurt early in last week’s blow out win over the Houston Texans. He’s not practiced all week and head coach Doug Marrone announced on Friday that his ankle injury will keep Lee from playing against the 49ers. Lee is easily Jacksonville’s best wide receiver. He leads the Jaguars with 56 receptions and 702 yards. Two of Jacksonville’s four losses this season have come in games in which Lee had two or fewer catches. Based on that, Lee clearly has an impact on whether or not the Jaguars win a game. With Lee being sidelined, it’ll be even more important for Hurns to return from injury. Hurns hasn’t played since November 12 because of a high ankle sprain. He’s close to returning but was still limited in practice this week. At this point, it’s a matter of managing the pain. Even if he plays, Hurns may not be 100%. If both Lee and Hurns miss Sunday’s game, the Jaguars will have to lean heavily on the young trio of Keelan Cole, Dede Westbrook, and Jaydon Mickens. Those three have seemingly come out of nowhere to help the Jaguars over the past month. Cole, an undrafted rookie, exploded for seven catches and 186 yards in last week’s win against the Texans. Westbrook, a 4th round rookie, has caught 19 passes over his last four games. Mickens had four catches, two for touchdowns, last week against Houston. “I have confidence in those young guys,” Marrone said of the trio of Cole, Westbrook, and Mickens. Of course, there’s a difference between playing a complementary role to receivers like Lee or Hurns and being the top receiving targets. That could be a question the trio of Cole, Westbrook, and Mickens may have to answer this week. The silver lining is that San Francisco’s secondary is a little banged up and does rely on a couple inexperienced cornerbacks. However, the 49ers have also won three games in a row, so they’re playing with a lot of confidence right now. Eventually, both Lee and Hurns should be back. By the time the Jaguars play their first playoff game, both are likely to be on the field. However, Jacksonville still has business to take care of during the final two weeks of the regular season. Even with Blake Bortles playing some of the best football of his career in recent weeks, being without both Lee and Hurns could hinder them late in the regular season.